Spring cleaning season is upon us. And if you’re like me, that kitchen could do with a good scrubbing. Oh winter procrastination. Time to break out the bleach, all-purpose cleaners and the Swiffer wet jet—sike. Those conventional cleaners contain dangerous chemicals—not exactly the stuff you want hanging around the space you use to whip up meals. Homemade cleaning concoctions made with natural ingredients can get the job done just as well, if not better. All you need are a few common ingredients. You probably even already have them in your pantry, you eco-chick. For those hot spot areas in your kitchen that could do with a good scrubbing, try these great-performing green cleaners for the kitchen. Even stainless steel sinks can get not-so stainless at times. To scrub away caked on soap scum, combine ¼ cup baking soda with just enough warm water to form a paste. 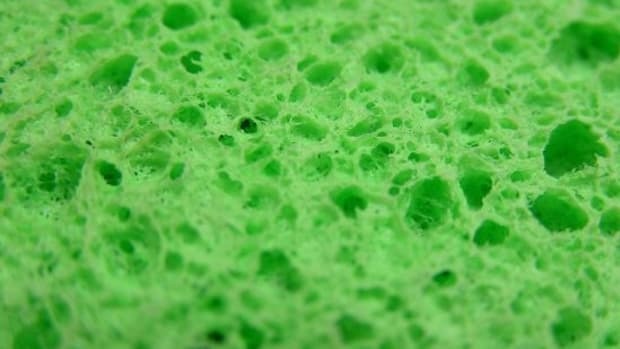 Place some of the mixture on a rag or sponge and give it some elbow grease. 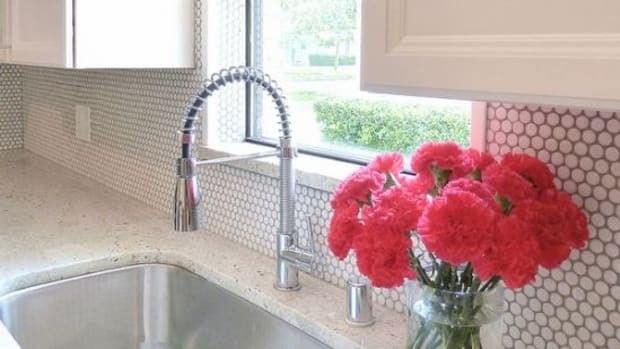 Your sink should sparkle in no time. Unblocking clogged drains can be a tough task. Luckily this natural recipe to remove clogs packs a pretty powerful punch. Pour about ½ cup baking soda (use a little more for tough clogs) down the drain. Follow it with ½ cup white vinegar. Immediately cover the drain with a plug. The baking soda and vinegar will create a chemical reaction like a mini volcano. It’s like seventh grade science all over again! Let the ingredients work for about 30 minutes. While you’re waiting (patiently, I’m sure) for the mixture to work, boil a kettle of water. After 30 minutes slowly pour the entire contents of the kettle down the drain. Repeat if necessary. 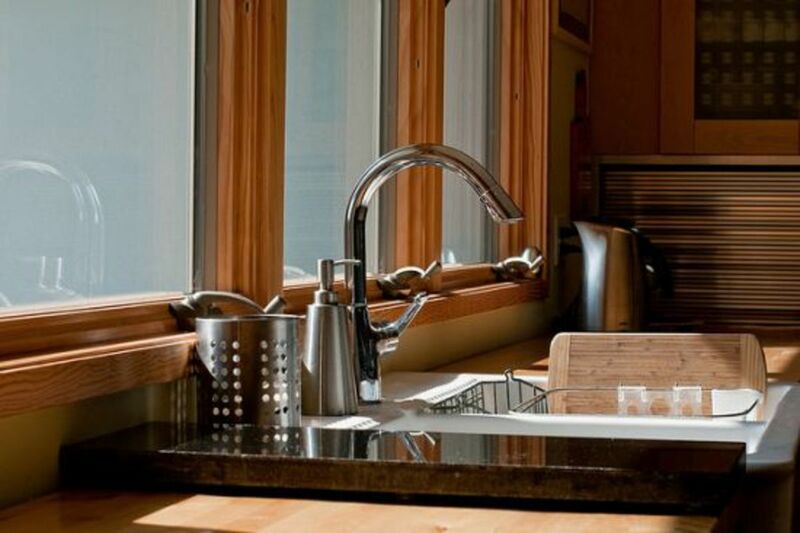 Keep your sink faucets and handles sparkling with the all-purpose cleaner recipe below. 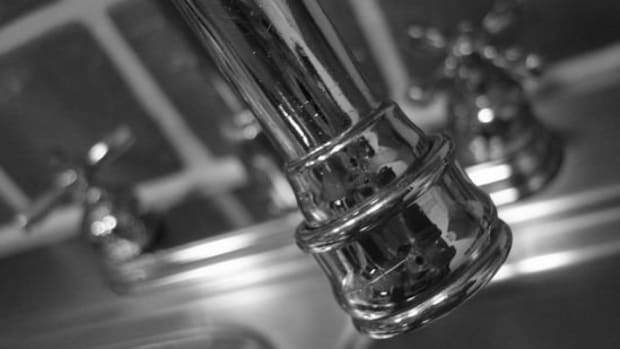 Don’t use the baking soda mixture because it will leave your faucets streaky instead of shiny. 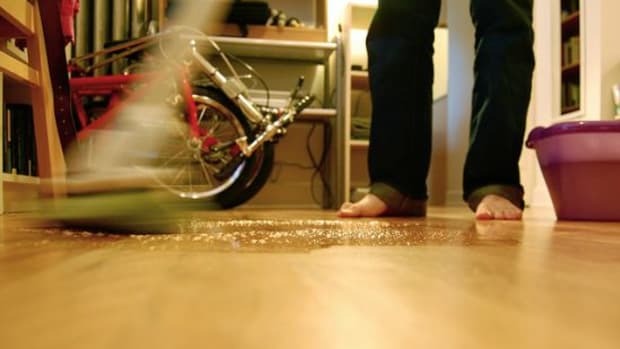 For a simple all-purpose cleaner, combine one part white vinegar with one part water in a squirt bottle. Give it a little shake and you’re ready to disinfect. Don’t use this method on granite or marble countertops as the acidity of the vinegar can damage them. 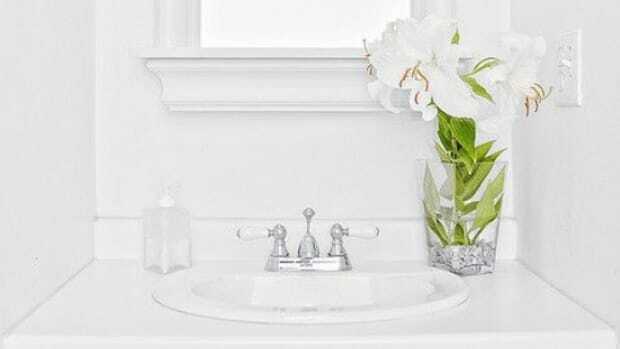 Clean granite and marble with hot water or club soda. Remove pesky set-in stains on countertops with lemon juice. Let the juice sit on the stained area for about five minutes, and then wipe it clean. Get rid of funky odors in your garbage disposal by dropping a lemon peel (or any citrus fruit peel) or two down the drain. Turn on the water and flick the on switch to give it a good grind. Afterwards your disposal should smell lemony fresh. I’ll admit it; I tend to procrastinate when it comes to cleaning grease splatter off the stovetop. Use a combination of coarse salt and baking soda to scour away any crusty burnt gunk for a spotless stovetop. This won’t work for certain stovetops where scratching is a concern, such as a flat top electric stovetop. A mixture of baking soda and warm water also works well to strip grease from drip pans. 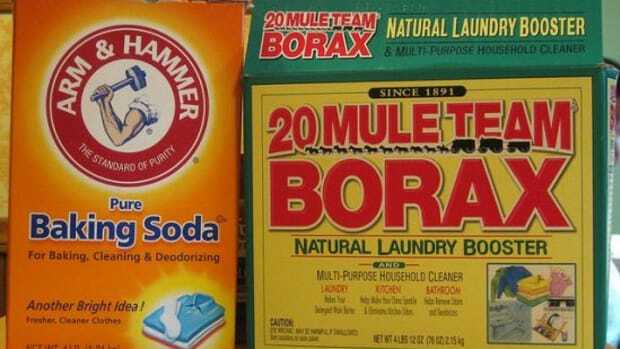 Borax, a product similar to baking soda, makes a great scrubber to clean refrigerators. Use the same method mentioned above by combining ¼ cup Borax with just enough warm water to form a paste. As you wipe away grime from spilled foods and drinks, the mixture will also deodorize as it cleans. Finish by wiping everything down with a damp cloth. We&apos;re not huge fans of microwaves at all, but we can certainly remember how nasty they can get. If you haven&apos;t ditched your microwave yet, blend ½ cup water and ½ cup white vinegar in a microwave-safe bowl and heat the water in the microwave until it boils. The steam will eliminate any lingering odors (like that popcorn smell that never seems to go away) and loosen any caked-on food for easy removal. To get a kitchen floor that’s spick and span mop with the all-purpose cleaner mentioned above. Add a couple drops of your favorite essential oil to the mixture to give the room a refreshing scent. 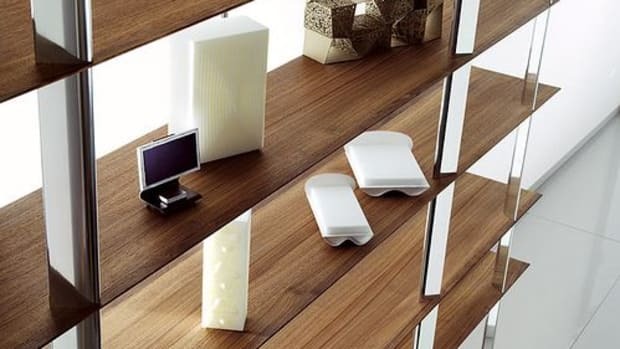 A spring cleaning isn&apos;t finished without getting rid of junk and excess items. Discover how to create an orderly kitchen with our guide to eliminating clutter in the kitchen.